It has been said about a millions times, but I’ll say it again – content is King. Curating strong ad copy on Google is not a tedious or hard activity to carry out. However, to write copy that generates online conversion, we need to flex both our creative and scientific muscles. When writing copy, it is critical to keep the user experience in mind. It is important to think about the process your visitor will go through when searching for a keyword or phrase relevant to the service or product you offer – from query, to ad copy to landing page. If the user experiences a speed-bump along the way or feels as if they may be heading down the wrong route, they WILL click the back button and likely find an online competitor of yours that meets their needs. Thus, resulting in you losing money on a click, as well as the profit that the potential client would have generated. An additional point to take into consideration is your landing page. No matter how good the ad copy is, you will not be successful in converting the prospect if the landing page is not strong. 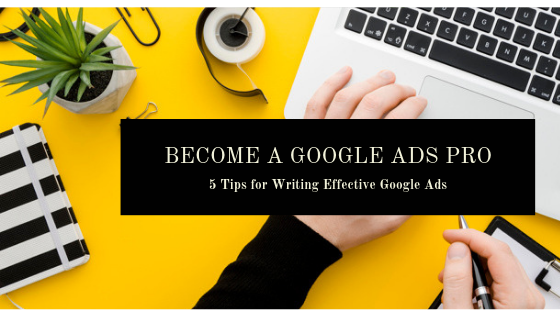 Below we have listed 6 tips and tricks to keep in mind when writing copy for online ads. It is important to remember that no two businesses are the same and just because something works for one does not mean it will work for another. It is all about identifying what works best for your business, while taking your target market into consideration. A standard practice when creating ad copy is ensuring you include the keywords and phrases selected, in the creation of your adgroup, in the advert copy. Mirroring those keywords in the headlines and descriptions increases the likelihood that your advert will show when those terms are used to search for a service or product. This being said, it is important not to keyword stuff. Your sentences need to be coherent. And as that is saturated with keywords, they likely do not portray the intended message. Going one step further and using your selected keywords and phrases in the introduction or header of your landing page copy is highly recommended. By carrying out this activity, your landing page tells the searcher they have come to the right place, and will also assist in lowering your bounce rate. Be specific with your keywords and phrases. When a potential customer is searching for a product or service online, they tend to utilise specific search terms. This ensures the SERP generates exactly what they are looking for. Specific search terms are more likely to convert traffic as opposed to broad terms. When using broad terms your advert is likely to gain more traction, however, this does not necessarily mean that your advert will always show for relevant search terms. Below we have created a table highlighting the different degrees of specificity. Every time someone searches, they are telling you what it is they are looking for, listen to them and ensure you deliver the results with as much specificity as you can. Ad extensions are additional areas of text that you can fill out in your ad campaign which extends the size of your advert and provides additional information to the searcher. Each ad extension has its own use and purpose. Below is a list of the various ad extensions available, not every single one will apply to your business, so use the ones that do. The entire objective of running adverts online is to drive traffic to your website and ultimately convert the traffic. Whether you measure your conversions as an online purchase, downloading a whitepaper or making a phone call, you and your business should have an objective. To ensure that objective is achieved, it is essential to tell searcher what action you require of them. Not matter the action, it is important to either use that wording in the ad copy or give them a clue as to what you want. This practice helps you save on the cost per click, as people who are not interested are likely to avoid your advert. Is it something you would click on? Does the copy in the ad make sense? Does the copy on your landing page highlight what you have to offer, as stipulated in your ad? To find out more about writing Google Ads, landing pages and our PPC services, be sure to contact our expert team of marketing experts. Call us on 0203 911 9715, email us on hello@firetap.co.uk or make an online enquiry here. Stuck for Content Ideas? Not Anymore!